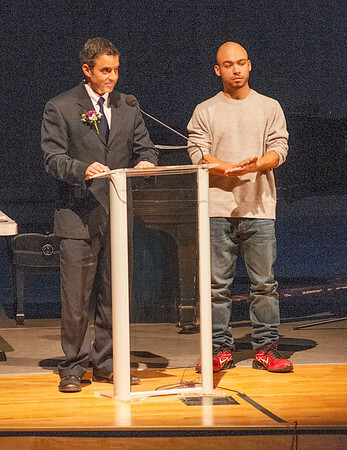 Niagara Falls, NY - Niagara Falls City Council President Andrew Touma presented the Civil Rights Achievement Award, posthumously, to Councilmember Robert Anderson Jr. at the Rev. Dr. Martin Luther King Jr. 2016 Celebration at the Niagara Falls High School Performing Arts Center. Accepting the award was his grandson Patrick Guiteau, right.